First Line: She loved this time when the town was still half-asleep. The annual Palkin Festival, which honors a fourteenth-century mayor, is in full swing in the city of Tradmouth. The discovery of the body of a strangled woman in a dinghy floating out to sea coincides with the anniversary of the disappearance of young Jenny Bercival, and Detective Inspector Wesley Peterson knows he's got to solve the murder as quickly as possible so that the festival isn't ruined for all the visitors making their way into town. It's not long before Peterson begins to wonder if there is a connection between the missing girl and the dead woman. And is there another connection to a fantasy website called Shipworld which features that long-ago Palkin as a supernatural hero facing a sinister nemesis called the Shroud Maker? These connections look more and more likely when archaeologist Neil Watson makes a grim discovery on the site of Palkin's warehouse. Wesley Peterson may have to find his answers by looking into the past. I don't know how Kate Ellis does it. 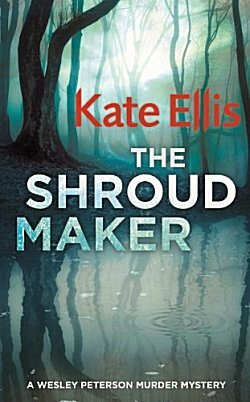 The Shroud Maker is the eighteenth-- and one of the best-- in her consistently high-quality series. I'd no more miss one of these books than I'd forget to put my glasses on when I get up in the morning. Ellis knows the perfect way to combine a present-day murder investigation with a fascinating bit of history. The chapters in the book begin with either an excerpt from a biography of John Palkin or a letter written by the biographer's wife. It is a very effective way of allowing readers to form their own ideas as to what's happening because-- as it usually does in a Wesley Peterson mystery-- history is having a decided effect on the present day. However, Peterson's investigation is hampered by the Palkin Festival because it's bringing in all sorts of criminals, making it difficult to match the right crime with the right bad guy. Ellis always has a fascinating combination of crime and archaeology, but her characters are what make this entire series shine. Through eighteen books, these characters have grown and changed, and I've been witness to many of their life-changing events. The Shroud Maker is no exception. Wesley's wife Pam seems to have grown into the role of policeman's wife. One of Wesley's detectives, Rachel, is suffering from pre-wedding jitters, and Wesley's boss, Gerry Heffernan, is worried about his headstrong daughter, Rosie. If you have the slightest interest in British police procedurals that combine strong mysteries with archaeology, history, and a fine cast of characters, I urge you to sample one of Kate Ellis's Wesley Peterson novels. You can read them as standalones with little or no confusion, but what's the fun in that? Do what I did and begin with the very first book, The Merchant's House! Isn't this a great series, Cathy? It doesn't get the hype that some other series do, but it's very well-written, and I do like the setting. I like the way the characters are evolving, too. It's a splendid series, and it's deserving of some hype! I think I read THE MERCHANT'S HOUSE a bunch of years ago. I remember I liked it, but I didn't continue on. I've just discovered that I have it on my Kindle. Think I'll start there and then go on. I love archaeology and mysteries combined. It's one of my favorites, Kay. If I remember correctly, there's only one book in the entire series that fell flat for me. Later on I learned that she had to have been trying to write it while her mother was dying. No wonder! I enjoy this series too. I have only read the first four books but have books 5 through 9 here to read. I plan to read more from my TBR group this year. I started last night Beneath the Abbey Wall by A.D.Scott which has been on my TBR list for awhile. Found the A.D. Scott series through you. I think I will now read The Bone Garden by Ellis after the A.D.Scott book. Interesting! Now I am going to look for the name of the street in the book. It is also interesting that it is an actual location written about in the book. Also, you have a good memory to remember the street name. Scott grew up in Inverness, so she's quite familiar with the territory. She lives thousands of miles away now but does go back on research trips, which is when she went to Leakey's. When I mentioned it to her, she referred to it as the church it used to be when she lived in town.